Jane is a 45 year old teacher who came to see me because she had been struggling with fatigue, fuzzy thinking, low mood, dry skin, brittle nails, some hair loss and feeling cold all the time. She was worried because she was gaining weight despite careful diet and regular exercise. Her face and eyelids were puffy, and she was getting concerned about her memory, sometimes forgetting things in class which was unusual for her. She commented even when she exercises, she doesn't sweat like she used to, and her periods are getting more erratic. She has a family history of "low thyroid" , or hypothyroidism. She has had 2 or 3 TSH lab tests in the past and told they were "all within normal range", but she has done her own research and was convinced she had a thyroid problem. The only other thing she reports is that corn and dairy bother her digestion. Unfortunately, this is a very common scenario! It has been estimated that as many as 52 million Americans suffer from hypothyroidism, the most common thyroid condition. This amounts to about 3 or 4 out of 10 individuals! Let's take a closer look at the thyroid and what can happen when it does not function properly. 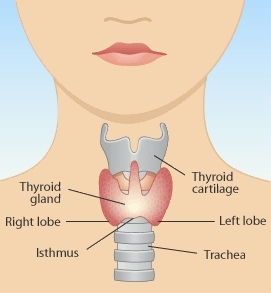 The thyroid is a butterfly shaped gland that is located in the lower part of the neck. It weighs less than an ounce but is responsible for many critical functions in the body. It regulates the metabolism, and maintains optimal cell function. It secretes about one teaspoon of thyroid hormone a year, and must drive the metabolic rate of every cell in the body!!! So, you can see, small variations in the amount of hormone can vastly impact a person's health. What Hormones does the Thyroid Produce? The thyroid produces 2 major hormones, thyroxine (T4) and Triiodothyronine (T3). The pituitary gland in the brain produces a pituitary hormone called Thyroid Stimulating Hormone (TSH) which tells the thyroid gland to make T4. The body must then convert T4 into T3. T3 is the hormone that actually increases the metabolism of the cells. Our patient, Jane in the introduction above had many of the common symptoms of low thyroid. Some other symptoms might include :muscle aches and pains, change in heart rate, swelling in the neck (when the thyroid enlarges this is called a goiter), weakness, elevated cholesterol, heart problems, blood pressure problems and other symptoms. It is important to understand that some people will have just a few of the typical symptoms, and others might have many. There are many factors contributing to the development of hypothyroidism. Some common factors include, genetic predisposition, nutritional deficiencies such as iodine, selenium , B12 and zinc, toxic exposure, hormone imbalances , stress/adrenal dysfunction, estrogen excess, smoking, old age and certain medications. Some people, for one or more reasons have a difficult time converting their T4 to the active T3 hormone. This is important to understand when we discuss treatment of low thyroid. Here we will discuss both conventional and holistic methods of diagnosing hypothyroidism. The conventional method generally primarily revolves around the measurement of blood tests, primarily the TSH, and occasionally T3 and T4. If the TSH (remember this is a pituitary hormone not a thyroid hormone) is elevated, it is a sign that the pituitary senses a low level of thyroid hormone. If the TSH is normal, many practitioners believe this rules out a hypothyroid condition. There is still not uniform agreement among experts as to what the "normal" TSH ranges should be. In most labs the "range" is 0.54.5. So if a person's test is over 4.5, they would be considered to have hypothyroidism, conventionally speaking. Solely relying on the TSH increases the chances of missing the diagnosis of low thyroid causing unnecessary suffering. A holistic approach to diagnosis takes into account each person's biochemical individuality, their symptoms, medical history, basal body temps, and thyroid blood tests, including Free T3, Free T4, and often thyroid antibodies. The holistic practitioner also takes a dietary history and evaluation of the patient's lifestyle, medications, toxin exposure, hormone status, etc. So What Happened with Jane? Jane had a thorough history, examination and review of her labs, including TSH, FT4 and Free T3. Her TSH was indeed normal, but her Free T4 was low normal, and her Free T3 was low. She was also found to be deficient in Vitamin B12, a common finding in patients with low thyroid. Her diet was relatively sound, but she ate a lot of unfermented soy, which can contribute to problems converting T4 to T3, so it was recommended she discontinue that practice, and either eliminate soy or change to fermented soy. She admitted a great deal of stress in her teaching job, and found very little time for herself. Her treatment plan included nutritional guidance, some B12 supplementation, and stress management. After discussing her medication options, we decided together to try a course of natural dessicated thyroid, NatureThroid, because it includes both T4 and T3, and is free of the corn starch and lactose present in some of the other medications, since she is sensitive. At her followup visit one month later she was pleased to report her energy was much better, her hair had stopped falling out and her thinking was much clearer. Her face had lost its puffiness, and she had lost a few pounds with minimal effort. She is making time for herself, and feels much less stressed. We are optimistic she will make a full recovery. We will continue to monitor both her symptoms and lab tests, and make any necessary adjustments.She would also like to be tested for other food sensitivities in the future, so this is planned. She is glad she continued to advocate for herself in seeking help! Here at New Beginnings Healthcare we offer an integrative, holistic approach to care for both women and men, with a focus on the whole person, mind, body and spirit. If you or someone you know is looking for a fresh look at a health concern, or just want to achieve your best health please call us at: 570-329-CARE.